The University of Rhode Island will welcome Black Panther Party co-founder, Bobby Seale to speak for a third time since 1978, this coming Thursday, Feb. 26. Seale will be featured as the keynote speaker of the newly instated Race, Violence and Democracy Colloquium, sponsored by URI’s Africana Studies Department. Though often remembered in history as a violent organization that protected and armed African American citizens against police brutality, this was only part of the party’s goals. Â The party also stood for more equality between the races and to improve the finances and education levels in the black community. Seale is one of the last surviving activists of his time, when violence and racism were a much larger part of every-day culture. Â His efforts and advancements for equality have made him a significant figure in civil rights. Fourth year student Alexandra Castillo took the initiative to invite Seale in Jan. of 2014, after being inspired by her GWS 310 professor, Dr. Ulli K. Ryder. Â Castillo was prompted to email Seale due to a tweet she saw encouraging students to reach out if they were interested in Seale speaking on their campus. Â Though her success seemed unlikely, Seale was quick to respond and accept. Castillo hopes that students will benefit from hearing Seale speak because she believes our generation “doesn’t have any inspiration or motivation enough to change what we believe in. We sit back on social network and just go on rants. Â No one’s really doing anything.” Â Many students may also have interest in what Seale has to say, due to the increasing number of police brutality events, such as the ones in Ferguson. “Discrimination and racism are alive to this day, and I feel that we should show respect to this man, who risked his life and freedom…this man changed a lot of our lives and history, but we don’t get to learn it because the Panther movement was seen as violent,” said Castillo. Â She said hearing Seale speak would be an opportunity to hear the truth that most students never have the chance to hear. Dr. Vanessa Quainoo, Director of Africana Studies here at URI hopes that professors will give incentive and encourage their students to attend. Â “The event gives students the chance to engage history face-to-face and see someone who was on the frontlines of the civil rights movement,” Quainoo said. Â The Africana Studies department wishes everyone one to feel welcome to attend and also study within the department – as a major field of study, or even just a cultural credit, because they firmly believe that Africana Studies is for everyone. 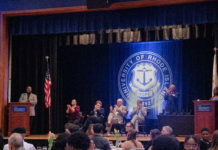 The event was made possible not only through her own efforts, but by students Jenelia Aponte-Andrade and Gianelle Alba, Dean Earl Smith, the Talent Development program, the College of Arts and Sciences, our President, the Provost, and especially Professor and event director Barry O’Connor – all of whom Castillo and Quainoo were quick to credit. Seale will speak at 6 p.m. in the Thomas M. Ryan Family Auditorium of the Center for Biotechnology and Life Sciences, free of charge.